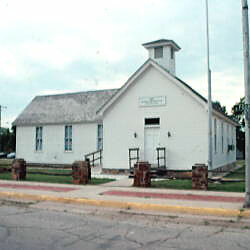 Description: This building is the old GAR meeting place. 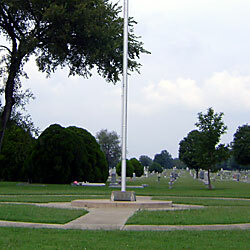 Description: A large brick and stone monument is located with a flagpole. 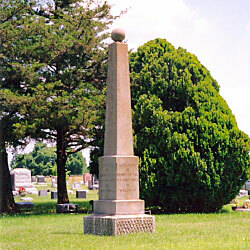 The central inscription reads: "To Our ~ Defenders ~ 1775 - 1918 ~ This Monument ~ Sponsored By ~ Ernest Brown Post ~ 138, American Legion ~ Was Erected By The ~ Patriotic Organiza- ~ tions And Citizens ~ Of Caney". Above this inscription are bronze medallions for Spanish American War Veterans, G.A.R., and American Legion. 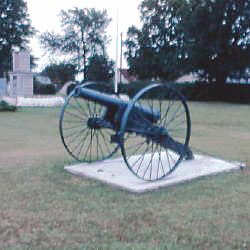 A 6-Pounder field gun on historically inaccurate carriage and wheels is mounted on a concrete pad. The sign associated with this cannon reads: "Walking Stick Cannon ~ manufactured 1822 ~ at Fort Pitt Foundry, Pitts, Pa (FPF) ~ 6 pound shell ~ 3.58" bore ~ weight 742 lbs. ~ This impractical slender design caused ~ the barrel to burst. Only 100 were ~ manufactured. Only 14 of this style survive ~ in the United States. Eight men were ~ needed to fire one shell. ~ First served Sinclair Tank farm east of ~ Caney, later obtained by city as War Memorial ~ and a monument to peace as it never ~ fired a shot in anger." Description: It was reported that "Cherryvale, post 142 erected a monument sixteen feet high, built of Bedford limerock, costing $230, obtained by one-dollar donations, principally from old comrades." 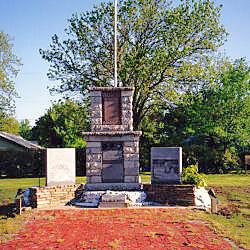 "1899 ~ Erected ~ To ~ The Memory Of ~ The Union Soldiers ~ And Sailors Of ~ The Civil War". "Dedicated ~ In ~ Memory Of The ~ U.S. Armed Forces ~ Of The ~ War With Spain". "Dedicated ~ In ~ Memory Of The ~ U.S. Armed Forces ~ Of ~ World War I". "Dedicated ~ In ~ Memory Of The ~ U.S. Armed Forces ~ Of ~ World War II". 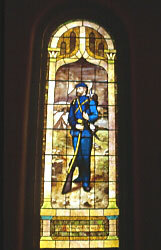 Description: This window, showing a Civil War infantryman, was made by the Ford Bros Glass Co. in Minneapolis. 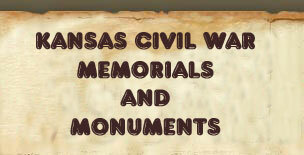 Description: It was reported that "In the Elmwood cemetery at Coffeyville a beautiful monument was dedicated October 8, 1908, to the memory of "Union Soldiers and Sailors." It is of Vermont granite, fifteen feet high, and stands at the entrance to the cemetery, a tribute to nearly 100 heroes resting near by. It cost $1400, raised by the Woman's Relief Corps." Martin 1910. 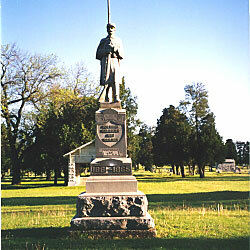 The inscription reads: "In Memory Of ~ Our Union ~Soldiers ~ And ~Sailors ~ Erected by Coffeyville ~ W.R.C. ~ No. 174 ~ 1861 - 1865". "McPherson Post ~ No 4 (GAR) ~ Chartered July 9 1875 ~ In Memory Of Our Departed Comrades". "Dewlen-Dix Post ~ No 1186 (WW I) ~ Chartered October 20 1930 ~ In Memory Of Our Departed Comrades". 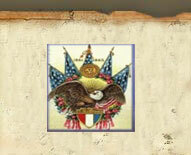 "Wm McTaggart Camp ~ No 25 (Spanish American War) ~ Chartered September 25, 1920 ~ In Memory Of Our Departed Comrades". "Harold R. Andrews Post ~ No 139 (??) 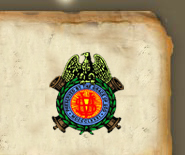 ~ Chartered Aug 20 1920 ~ In Memory Of Our Departed Comrades". 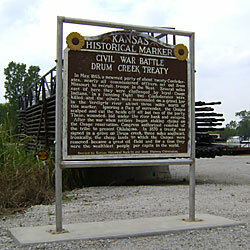 Description: This roadside marker reads: "Civil War Battle ~ Drum Creek Treaty ~ In May, 1863, a mounted party of about twenty Confederates, nearly all commissioned officers, set out from Missouri to recruit troops in the West. Several miles east of here they were challenged by loyal Osage Indians. In a running fight two Confederates were killed and the others were surrounded on a gravel bar in the Verdigris river about three miles north of this marker. Ignoring a flag of surrender, the Osages scalped and cut the heads off all but two of the party. These, wounded, hid under the river bank and escaped." "After the war when settlers began staking claims on the Osage reservation, Congress authorized removal of the tribe to present Oklahoma. In 1870 a treaty was signed in a grove on Drum creek, three miles southeast. Ironically, the cheap lands to which the Osages were removed became a great oil field and for a time they were the wealthiest people per capita in the world." "Erected by Kansas Historical Society and State Highway Commission."